This painting, “Here’s Looking at You”, arrived in its new home a few days ago. The painting was commissioned by someone who was a pleasure to work with. As many artists know, commissions can occasionally be quite difficult, since there are times that the buyer has a very specific notion in mind of what is wanted, but is unable to express it in advance of the work’s presentation. 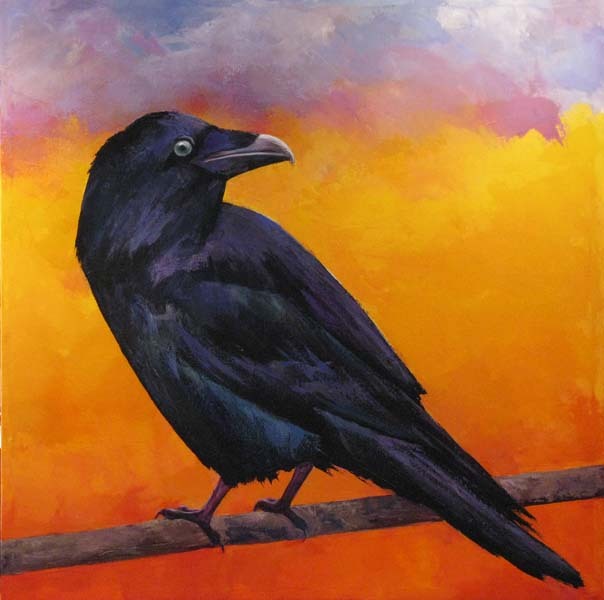 In this case, I was told the basics: size (36″x36″), subject (a solitary raven), and that the bird be “natural” (rather than in “party animal” colour). Beyond that I was given artistic license. The final result was smiles all around.